Opal Cowen has been summoned back to Sita’s Magicians Keep by the high council. Never a good sign. After an unsuccessful trip to find her lost friend Ulrick who has switched souls with her long time enemy, Opal heeds the summons and returns only to be put under house arrest. Her new-found power of siphoning the magic of others has the Keep on high alert and she must earn back their confidence. Maria Snyder has proved wrong the common notion that sequels are never as good as the original. 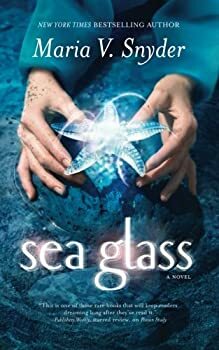 I enjoyed Sea Glass much more than I liked its predecessor Storm Glass. Snyder’s characters are much better developed here — they have more depth and were therefore more enjoyable to read about. Sea Glass was a slow starter. I was on page 252 before I really started to become interested in the plot and wanted to find out if Opal would succeed in the end. 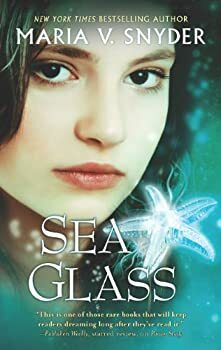 It wasn’t that the first 250 pages were dull, but just that they were too reminiscent of the plot in Storm Glass: Opal gets either lured into a trap or abducted, and fairly easily finds her way out of it again. Déjà vu. For that I have to applaud her, I suppose, because it demonstrates that I found Sea Glass extremely entertaining and exciting. Overall, Snyder has crafted yet another magical book and has taken readers into a wonderful land of enchantment. Her characters are deep and stirring, and she has an uncanny ability to make the magic of the characters come to life. For those reasons I can overlook my small complaints and I am very anxious to read the third installment. Julie Waineo, one of our earliest guest reviewers, earned an MBA at Bowling Green State University. She also holds a Bachelor of Arts in International Studies with a minor in French. Now living in Virginia with her husband and dog, Julie is an avid reader of not only fantasy, but historical fiction, the occasional “chick lit,” and children’s literature. FanLit thanks this guest for contributing to our site!